As the Cold War between the United States and the Soviet Union escalated in the 1950s and 1960s, the federal government directed billions of dollars to American universities to promote higher enrollments, studies of foreign languages and cultures, and, especially, scientific research. In Cold War University, Matthew Levin traces the paradox that developed: higher education became increasingly enmeshed in the Cold War struggle even as university campuses became centers of opposition to Cold War policies. The partnerships between the federal government and major research universities sparked a campus backlash that provided the foundation, Levin argues, for much of the student dissent that followed. At the University of Wisconsin in Madison, one of the hubs of student political activism in the 1950s and 1960s, the protests reached their flashpoint with the 1967 demonstrations against campus recruiters from Dow Chemical, the manufacturers of napalm. 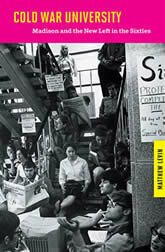 Levin documents the development of student political organizations in Madison in the 1950s and the emergence of a mass movement in the decade that followed, adding texture to the history of national youth protests of the time. He shows how the University of Wisconsin tolerated political dissent even at the height of McCarthyism, an era named for Wisconsin’s own virulently anti-Communist senator, and charts the emergence of an intellectual community of students and professors that encouraged new directions in radical politics. Some of the events in Madison—especially the 1966 draft protests, the 1967 sit-in against Dow Chemical, and the 1970 Sterling Hall bombing—have become part of the fabric of “The Sixties,” touchstones in an era that continues to resonate in contemporary culture and politics.